Posterior ankle impingement (PAI) is, by definition, a syndrome based on clinical diagnosis. It enrolls a group of pathologies characterized by posterior ankle joint pain usually aggravated by plantar flexion. Repeated loading with micro-traumatisms is probably the most frequent mechanism. This can lead to hindfoot pain, sometimes causing restriction of motion, with subsequent limitation of activity and sports participation. However, single traumatic mechanism is also possible. Ankle sprain is amongst the most frequent musculoskeletal injuries, particularly during sports activities. Posterior impingement might be linked with chronic ankle instability. Many different causes of PAI have been described which are frequently grouped in bony (os trigonum, posterior talar process, ossicles, loose bodies, “hidden fractures”), soft-tissue (cysts, synovitis; labral injuries; hindfoot ligament hypertrophy), and joint-related PAI. Posterior impingement must be differentiated from other causes of hindfoot pain such as Achilles tendon pathology, peroneal’s pathology, tibialis posterior tendon pathology, and damage to the tibial or sural nerves. Although PAI is a possible cause of pain in the general population (particularly in irregular ground or using stairs or high heels) it might be an even more debilitating condition in certain sports such as football (kicking the ball in hyper-plantar flexion) or dancers, amongst others. Conservative treatment usually is the first option of treatment (shoe wear, orthosis, physiotherapy, injection therapy). However, upon failure of the previous, currently, arthro-endoscopic surgical procedures seem to be the gold standard, enabling shorter recovery, lower aggression, and favorable outcome. Depending on individual cases and surgeon’s experience, open surgery is also possible, with lower complications arising from the medial approach when compared to lateral. D’Hooghe P, Alkhelaifi K, Almusa E, Tabben M, Wilson MG, Kaux JF. 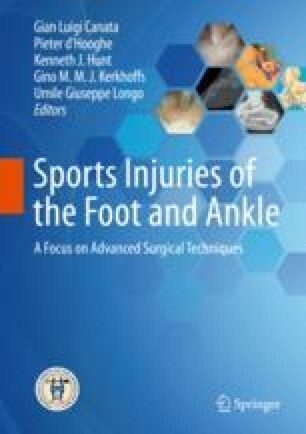 Chronic lateral ankle instability increases the likelihood for surgery in athletes with os trigonum syndrome. Knee Surg Sports Traumatol Arthrosc. 2018. https://doi.org/10.1007/s00167-018-5183-0.